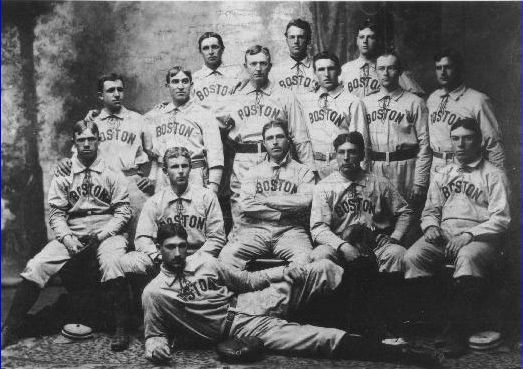 On May 2, 1901, Boston beat Philly on the road by a score of 23 to 12. Boston scored 9 in the 2nd and 10 in the third as 22 batted, with 7 BB,10 hits, 3 triples. This was a special team, created with great care by the brains behind the new league. Ban Johnson set up teams for his new American League in Boston, Philly and Chicago as he believed the AL could not succeed without stealing market share from the NL in these cities. Chick Stahl, and HOFer Cy Young, The Boston Americans hit more HR’s than any AL team (37), featured a regular lineup in which every man stole 20 or more bases, yielded the fewest runs scored, and struck out the most opposing batters. 1901 was a fascinating campaign. Right from the start, the Americans outdrew their in-town rivals Boston Braves. The Americans outdrew the Braves approximately 300,000 to 160,000. 9,000 fans at the Grounds was a common event. moves, including signing YMCA pitcher George Winter, who was a temporary wonder. Aided by a remarkable 49-20 record at home at the brand new Huntington Ave. Grounds, the Americans were soon in a tie for first. But when Collins soon went to a 3-man rotation of Young-Lewis-Winter, the Sox faded. They were in the mix until Aug. 25, when a 4-2 loss to Cleveland was marred by an attack on Umpire Pongo Joe Cantillion. 50 or more Sox rooters were outraged over Pongo Joe’s calls and attempted a physical beating after the game. Stahl pulled Cantillion out of the mess and ushered him to safety. The loss to Cleveland came when Boston was just a half game out of first. The Cantillion incident signaled the initial slide out of contention. In the end, Boston would finish 4 games out of first. Just like the 1950 team. June 29, 1950. By the time the second inning was over, 21 total runs had been scored and the Sox led 14-7. The succession of unending base hits and walks saw nine pitchers giving up 39 hits and 21 bases on balls. What a Red Sox line up ! DiMaggio (CF), Goodman (3rd B), Williams (LF), Stephens (ss), Dropo (1st B), Zarilla (RF), Doerr (2nd B), Batts (C), backing up Stobbs, the starting pitcher. 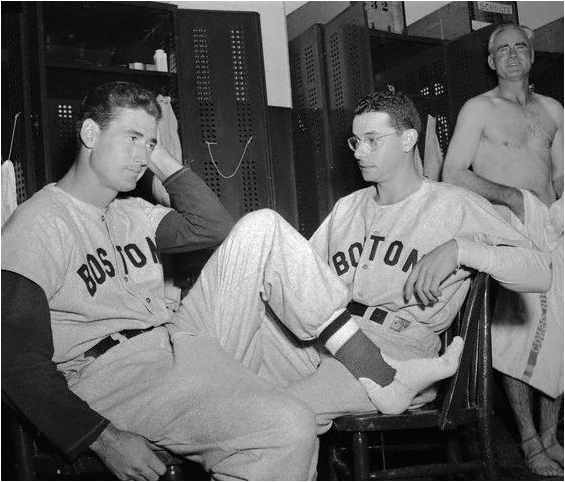 The hero of the day was Ted Williams. His 9th inning double drove in the record breaking run. He hit the only HR of the game, his 24th of the year. He drove in 6 runs, making his total 80 RBI through 69 games. Williams was on the greatest power tear of his life. At this pace he could finish with 54 HR’s and 179 RBI. He could challenge Gehrig and Ruth’s respective RBI and HR season records. Williams would break his elbow less than 2 weeks later, crashing into the wall to pull down a Ralph Kiner fly at the All Star Game. Ted would miss the next 10 weeks and hit just 5 more HR’s. This team would finish a very respectable 94 W – 60 L. They would lead the AL in batting at .302, Slugging at .464, Runs scored at 1,027, Doubles with 287, Fielding at .981. Despite losing Ted, the team kept winning without him. Walt Dropo was the ROY, and Walt tied Vern Stephens for the Al RBI title with 144. Doerr and Pesky had fine seasons. Billy Godman led the AL in batting with .354. The team liked home cooking, too, with a 55 – 22 record at Fenway. The Yankees went 8 – 4 in the final 12 games of the season while the Sox went 5 – 7, sealing their fate. Our guys had entered the middle part of the vast 86-year span of mishaps and suffering. August 12, 2008. Big Papi hits TWO 3-run HR’s in the first inning. Sox lead 10-0 after 1 inning. Sox starter Charlie Zink, the knuckle baller from Pawtucket, lost his edge while waiting for the long offensive inning to end. No longer in the groove, he yielded 7 quick runs. The next 5 Sox pitchers would yield 10 more. Dustin Pedroia, who went 5 for 6 and scored 5 runs, drove in Ellsbury in the 8th, and then Youkilis drove in the last 2 runs with his second HR of the game. This team showed little speed in that game with just 3 SB’s. But speed is a hallmark of this team, just as it was in 1901. Crisp and Ellsbury have game changing speed. 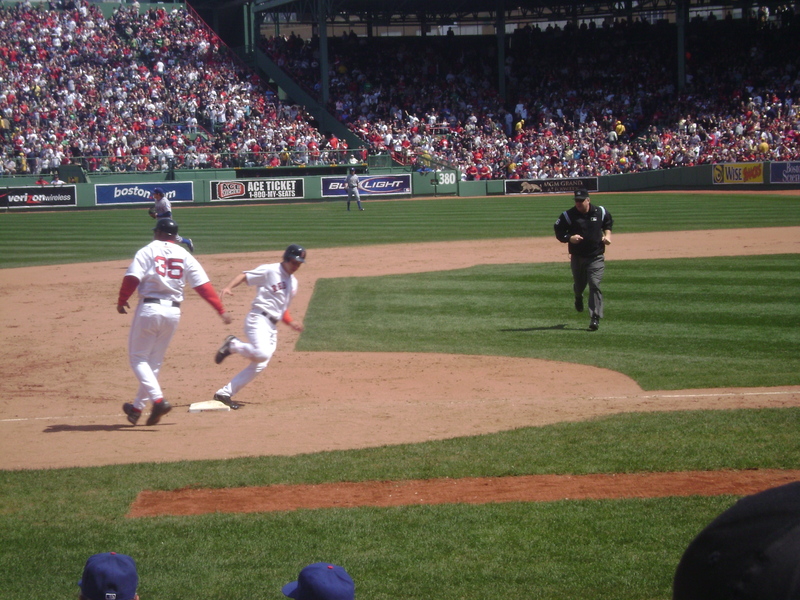 Pedroia, who defies expectations in so many ways, steals efficiently and hustles on the bases with nut busting effort. Lowrie, Bay, and Kotsay are fleet, smart base runners. There is enough power in the middle with Papi and Youk…or Papi and Bay….or Papi and Lowell. Take your choice. No insult to Lugo, but with Julio out of the picture, fielding is also this team’s hallmark. Bay, Crisp & Ellsbury are the most exciting outfield trio in years. The infield and catcher positions are solid. There could be three gold gloves for our guys this year: Ellsbury, Pedroia and Youkilis. Today the Sox got a great start out of Paul Byrd. Starting pitching has been the leading strength of this team all year. You get a quality start 67% of the time from Beckett, Matsuzaka, Lester and Wakefield. As the Sox took their 6th consecutive series today with a win in Arlington, the table was set for a strong finish. 20 games left. 6 games on the road. 14 at home. The Sox are 1.5 games behind Tampa, almost assured of the wild card and closing in on a Division title. Like the 1950 Red Sox, the 2008 edition lost its best hitter in July. Like the 1901 Bostons, the 2008 edition has speed, pitching and power. Unlike either of these two teams of history, the 2008 Boston Red Sox are a team of destiny. 3 Championships in this golden era of Red Sox baseball ? I’m feeling it. Are you feelin’ what I’m feelin’ ? This entry was posted on September 8, 2008 at 3:46 am	and is filed under BASEBALL, Boston Red Sox, David Ortiz, Dustin Pedroia, Kevin Youkilis, RED SOX, Ted Williams, Youkilis. Tagged: Most runs scored in game. You can follow any responses to this entry through the RSS 2.0 feed. You can leave a response, or trackback from your own site.